Paper Pawz: Lawn Fawn Pastel Christmas! Happy Monday Crafty friends! I made this card to submit it to the Lawn Fawnatics Challenge only I should have verified the date... I am a day late, lol! I had such fun making this one, I decided to share anyway. So the inspiration was the pastel color palette that was the last challenge over at Lawn Fawnatics. 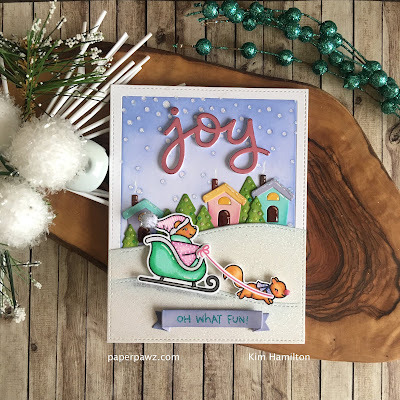 I do love non-traditional colors at Christmas and I wanted to use the Oh What Fun set from the last Lawn Fawn release. I started by die cutting my frame from Neena Solar White and the Tonic White Glitter paper using the Lawn Fawn portrait stitched hillside die. I then took the inside piece and die cut that again using the Lawn Fawn Portrait Snowfall background die. I then added a bit of Shaded Lilac Distress Ink with a really light hand. I thought this light purple was perfect with the pastel theme. Once that was complete I die cut all of my accompanying scene (all included in the Lawn Sawn Portrait Stitched Hillside die set) from a mix of Lawn Fawn and Simon Says Stamp cardstocks and shaded them lightly with the coordinating Distress Ink. I stamped and colored in my images with my Copic Markers, die cut them and put my little scene together. I added some Nuvo Crystal Glaze, Nuvo White Blizzard Glitter Drops, some white pen detail and some Nuvo Drops in coordinating colors on the trees. 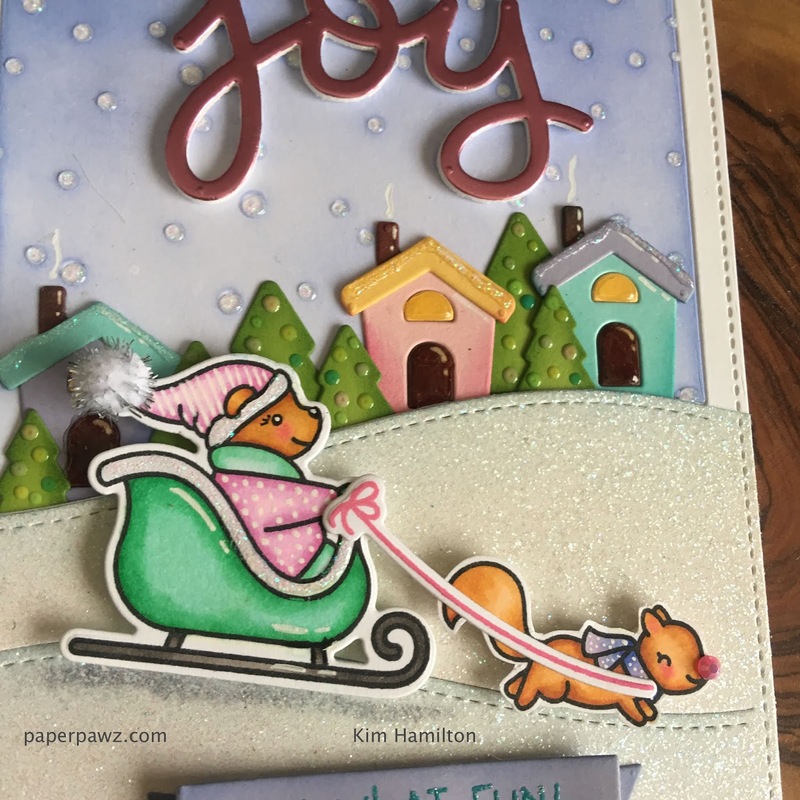 To finish off I added the Lawn Fawn Joy sentiment and the Oh What Fun at the bottom. Thanks so much for taking the time all products are listed and linked below. Affiliate links used at no extra cost to you!